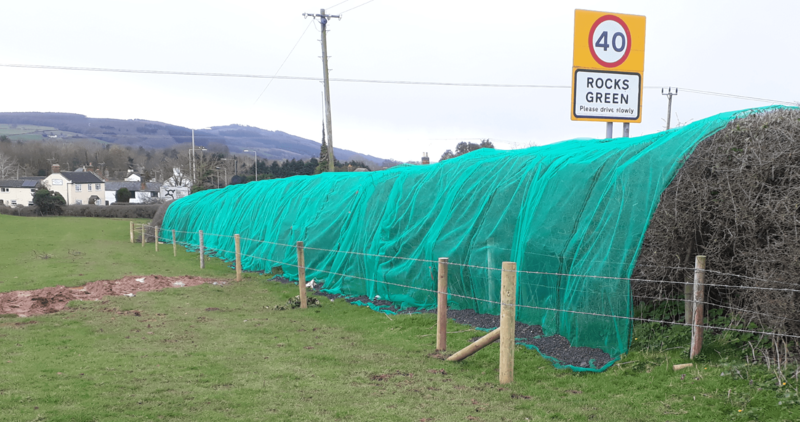 The hedgerows have been netted ahead of creating an access road to the development of 200 homes. The planning permission was issued in January (17/05189/FUL). That was only just in time for the hedge to be cleared before the nesting season which notionally begins in February. A number of technical details must be agreed with the council before the development can proceed (19/00983/DIS). But the approved documents make it clear that hedge clearance cannot happen in the nesting season. I don’t think this netting works. It is open at both ends and has many gaps along the length. Contrary to what the developers intend, it provides a sheltered haven for birds in prime nesting season. Many people believe that such netting simply acts to trap birds. This is not a new practice but its use seems to be growing. Chris Packham has expressed concern about netting hedgerows in Lincolnshire. Nottinghamshire Wildlife Trust has criticised the use of netting in Radcliffe-on-Trent. Birds have been trapped in netting in Grimsby. Guildford Borough Council ordered the removal of nets from trees on a housing site – the developer admitted the nets were useless because the site hadn’t got planning permission. The Daily Mail has a video with several examples of netting. In a different context, Tesco removed netting erected to prevent swallows nesting at a Norfolk store after protests from customers. There is concern that netting can also trap hedgehogs. After protests from schoolchildren, Taylor Wimpey said it would build tunnels enabling hedgehogs to escape from the Warwickshire site. Wild birds are protected. It is illegal to disturb nests. But getting evidence of nest wrecking is very difficult. Bulldozers and JCBs drive in. Hedges and trees are flattened and the evidence of nesting squashed and destroyed. I agree with that. We have two problems here. Part of the problem is the planning system. The Rocks Green housing application was agreed in September but it took five months to issue planning permission. That may have been down to legal negotiations. But if birds and biodiversity were a priority, they should have sped up that progress to allow enough time to clear hedges before the nesting season. The second issue is that most of Ludford parish is biodiversity poor. South of Ludford village the land is an open prairie. It is not much better between Rocks Green and Sheet village. There are no plans to improve biodiversity in the area, other than a few scraps of greenness and ponds offered by developers. That means every bit of wildlife haven we have counts. We need to improve biodiversity on Gallows Bank and the Linney too. Bromfield surely can’t continue boasting a local food complex while only making token gestures towards the environment. We do not have a biodiversity improvement plan for the Ludlow area. It is long overdue. But biodiversity doesn’t seem to be on our parish and town council’s agendas. They never discuss it. Most farmland bird species are in decline. This cannot continue. Birds are often the only bits of animal biodiversity we see. But if birds are declining, all the bugs and tiny beasties that are essential to the future of our environment and food supply will be dying too. This Eco Park site was allocated for a future hospital. Shropshire Community Health Trust now has no plans for its future. It would make a good wildlife reserve as part of an eco suburb east of the A49 bypass. Pickstock Homes rang to assure me that the work is being conducted under the supervision of a qualified ecologist. I accept that and could have made that clear in the article. That doesn’t make me any happier with the process. I am assured that the gaps in the netting will be fixed. The above statement has been challenged. I’ll provide another update as soon as I can. I have also been alerted to a parliamentary petition seeking to ban the practice of netting. The tiny claws of the most vulnerable smaller bird species will, inevitably, get caught in netting, as I’ve seen for myself. Is anyone nearby able to monitor the Rocks Green site? A project for local schools? The likes of small birds and hedgehogs need to be encouraged and cared for. Putting a huge net over a hedge is not only going to deter natural wildlife, but it will mame, injure, and put at risk, those little lives that DO matter to many people. Building a big housing estate is not going to help their cause. I don’t need to tell anyone that nature has an agenda, that should not be interrupted. It really is so important. I hope I can encourage the building bods to discuss and remove the offending nets for the sake of our wonderful wildlife. I visited the site today and took photos of the large holes which are developing. This net needs constant maintenance if it is in place legally. If it were erected within the nesting season, it is already in breach of the W&C Act 1981 for knowingly interfering with the nesting activities of birds in the nesting season, illegally, and should be removed. I will pass this information on to Hedgehog Street (www.hedgehogstreet.org). They are the British Hedgehog Preservation Society and their headquarters is at Dhustone, just up the Clee Hill. We are near Sheet Rd in Ludlow and have several hedgehogs visiting our garden every night now, they are very active and need protection as their numbers are in decline. This netting can’t be helpful for them or birds. You have been told a straightforward lie Andy – there has been NO CONSULTATION with any ecologist. I have emailed Pickstock homes and they haven’t deigned to reply. I have shared this information with an anti netting group. If they have left the end of the net open, birds can still get in and become trapped. I shall be monitoring this very carefully indeed and sharing updates on Social media. Pickstock homes clearly do not care about wildlife, eco systems or public opinion. 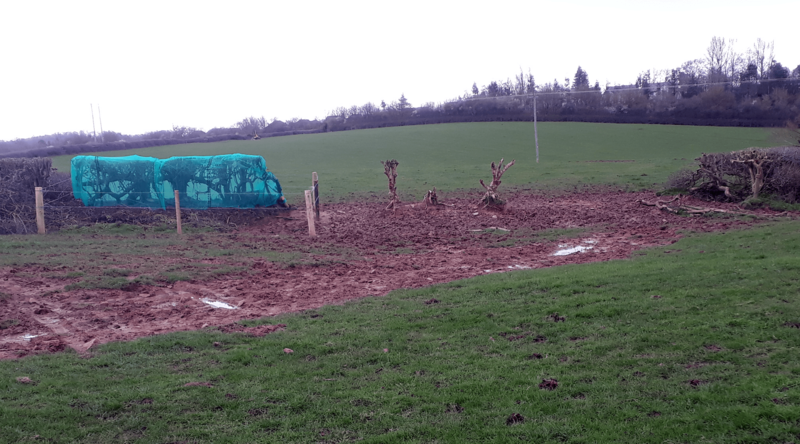 This last week 25th March they’ve been and taken lumps out of the hedge at each end so as to be able to secure the whole section of hedge. Must have been reacting to all the publicity. Surely only doing this now though must be illegal as the hedge could be still said to be nestable beforehand?